The Golden-Week happens in May. The Golden-Week is the longest holidays beside the new year's break and summer break in Japan. It starts from the end of April to the end of the first weekend of May. So, all of the travel spots in Japan will become pack of Japanese travelers. It is the worst season to visit Japan during the Golden-Week. It is so hard to make a reservation for hotels, transportation and restaurants, and some of the spots rise the price for this season. In the northern part of Japan, Ice starts melting, so many waterfalls have large amount of water which become not only beautiful but also very strong to see. Bank of Iwate Red Brick Bldg. This is the list of things to do in May in Japan, and the information of events, festivals and flowers in May. Nikko UNESCO Tour (日光の世界遺産巡り) is one of the most popular touristm around Tokyo. Nikko is located in Tochigi prefecture and one of the greatest spots in Japan. 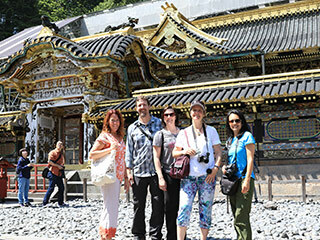 There are 3 great shrines and temples that registered as UNESCO World Heritage sites. They are one of the most expensive buildings in the world. The entire sites are built as the mausoleums of the founder of Edo Government. Those mausoleums has one of the best art of Japanese architectures. 1. use Local bus to Nikko 3 shrines.